Democrats advocating for a single-payer medical system often claim that the government-run system for the elderly — Medicare — is significantly more efficient than the private insurance market. The suggestion is that expanding a Medicare-type system to the entire health-care market would result in huge savings. We had started this fact check by focusing on Merkley, before Sanders appeared on television. But when we started to question Merkley’s numbers, his staff offered a forthright mea culpa: “He made the numbers up on the spot. He just got confused,” said spokesman Ray Zaccaro, noting it was a live interview. “Whatever he said was completely unrelated to whatever material we were given” by the Democratic Policy and Communications Committee. Regular readers know we don’t play gotcha at The Fact Checker. It makes a difference when a politician admits error, and we generally don’t award Pinocchios in such an instance. Still, this is an important issue worth exploring, as we suspect this talking point will be heard again and again. What we have here is a low figure for Medicare and high figures for private insurance. But the numbers are not set in stone and subject to dispute. Moreover, some experts say the comparison is faulty. But when Mark Litow, a former health actuary at Milliman Inc., looked at the issue in 2006 for a now-defunct industry group, he concluded that Medicare’s administrative costs were actually 5.2 percent when hidden expenses were included. While he has not studied the issue recently, he said the percentage was probably higher now. “Government systems are designed to make it look cheap, but they are expensive,” he said. Meanwhile, the estimates for the private-plan administrative expenses often include things that artificially raise the number. For instance, administrative expenses for plans can include a variety of state and federal taxes and fees. But AHIP spokeswoman Kristine Grow said it was inaccurate to label all of this as overhead or “wasted,” as Merkley put it. “Many people incorrectly assume that the majority of the remaining 18 cents goes toward activities like claims processing, member outreach, and quality reporting,” Grow said. “It’s true that this 18 cents does include those activities — which would need to be done even under a single payer system.” But she says it also includes things such as nurse hotlines, case managers, network management and maintenance, customer service operations, and federal, state, and local taxes and fees. Sanders’s staff also cited the AHIP website for the 18 percent figure. For the lower end of Sanders’s range, 12 percent, his staff pointed to a blog post by the left-leaning Center for Economic and Policy Research. Citing data on national health expenditures, CEPR estimated overhead costs for private plans at 12.3 percent compared to 1.8 percent for Medicare. Separately, to justify Sanders’s estimate that a single-payer system would save $500 billion in annual administrative costs, his staff cited a 2017 article in the Annals of Internal Medicine that calculated $504 billion in savings from converting to a single-payer system. The article estimated Medicare overhead was 2.2 percent and private insurance coverage was 12.4 percent in 2017. Reducing overhead to Medicare’s level would yield $220 billion, the article said. But it calculates an additional $225 billion in savings would be found in reductions in the cost of hospital administration and doctor office administration; an additional $59 billion would come from administrative savings in nursing homes, home-care agencies and other areas. Sounds great, right? But there’s a potential catch. Some experts, particularly on the right, say these estimates are measuring the wrong thing. Medicare patients are elderly and thus have high costs relative to administrative expenses, especially compared to the under-65 patients in private plans. So just looking at percentage of each dollar spent skews the result. A better method, these experts say, is to look at administrative costs per patient. “Medicare administrative costs are artificially deflated by the fact that the denominator is way higher than it is for non-elderly adults, and there are aspects of Medicare’s administrative costs that are paid for by other agencies,” said Avik Roy, a health policy adviser to Republicans. Robert Book, a health economist affiliated with the right-leaning American Action Forum, studied this question in 2009 for the Heritage Foundation, looking at administrative costs per person between 2000 and 2005. 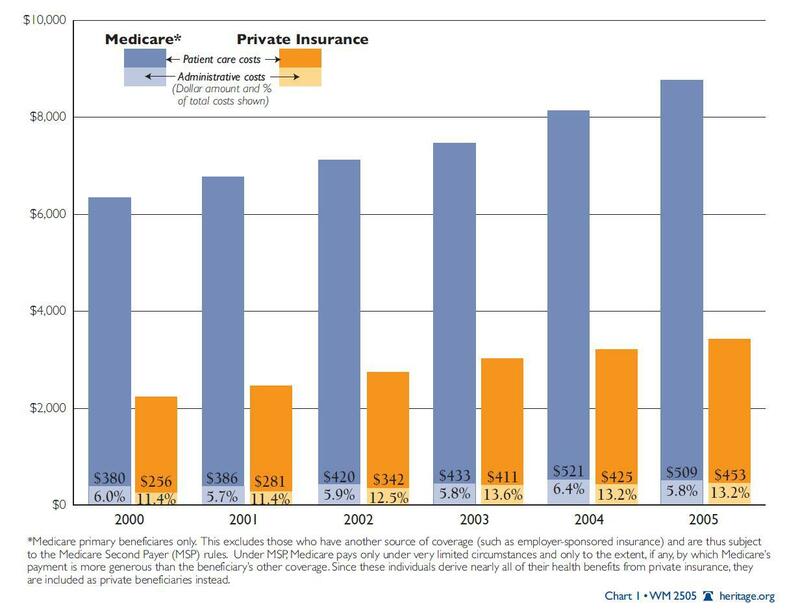 Measured as a percentage of total costs, Medicare appeared more efficient in 2005, 5.8 percent of expenses compared to 13.2 percent for private insurance. But it was more expensive on a per-person basis: “In 2005, Medicare’s administrative costs were $509 per primary beneficiary, compared to private-sector administrative costs of $453,” he concluded. “As percentage of total costs is inherently misleading,” Book said in an interview. “The patients in Medicare have higher medical costs. Medicare is always going to win, not because they are more efficient but because you are asking the wrong question.” He has not tried to do a more recent comparison, though he concluded in 2016 that the Affordable Care Act appears to have raised per-person administrative costs when government expenditures are included. Update: Economist Dean Baker of CEPR argues we gave too much credence to the industry perspective. Update: Blahous weighed in a deeper analysis. He concluded administrative expenses for Medicare are low, but says that does not necessarily translate into lower health care costs for consumers overall. As we said, given Merkley’s admission of error, we are not going to award Pinocchios. But there are serious issues with this talking point, even at Sanders’s more responsible-sounding range of 12 to 18 percent. The Medicare figure of 2 percent is artificially reduced because some key functions are undertaken by other agencies — and because Medicare’s patients are unhealthier. Meanwhile, the 18 percent figure for private plans appears to be inflated, so it would be more reasonable to rely just on the 12 percent estimate. But even if Democrats were to be conservative and say Medicare had administrative costs of 5 percent and private plans 12 percent, previous estimates of the administrative costs per patient indicate that Medicare is actually more inefficient than private insurance. We would be interested to see more recent calculations on this issue, but it certainly indicates that single-payer advocates are counting savings that might not materialize. Democrats should be cautious with this talking point to avoid Pinocchios in the future. in an interview on MSNBC"s "Daily Meet the Press"